On the surface, we provide companies and home offices with a green, budget-friendly solution to maintaining their UPS fleet. Behind the scenes, we expertly recondition UPSes, often making them perform better than when they first came on the market. Many people think that buying a new battery for their APC UPS extends its life and keeps their data protected. While installing a new battery might make that pesky light turn off, the unit needs to be recalibrated. If it’s not, the battery will actually degrade the life of the unit. Plus, your unit is no longer under warranty, and you are out of luck when it fails. 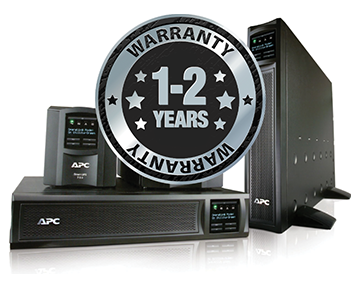 As the only authorized service provider of refurbished APC Smart-UPS and APC’s only Certified Pre-Owned provider in the United States, we are the only company that has access to APC’s Engineering Change Orders. Therefore, when APC makes an important change to their units, we do too. Often, the APC UPS refurbished units leaving our shop work better than the original. In fact, we recently teamed with APC to jointly offer a Comprehensive Protection Plan (CPP) under which we guarantee regular, timely service and emergency replacement for a customer’s entire fleet of refurbished uninterruptible power supplies. Get a free quote on refurbished APC UPS units. Contact us directly at 410-521-1000 or info@coasttec.com.